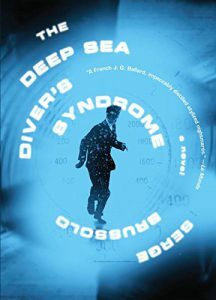 Originally published in French in 1992, The Deep Sea Diver's Syndrome is the first of Serge Brussolo's many books to appear in English. For the uninitiated Anglophone reader, then, it’s a single piece of a jigsaw that comes with no box or picture—a fleeting but intriguing sample of a bibliography that might spread off in any direction. The experience of reading the novel is something similar: an intense vision of a broader reality that still remains elusive—that hangs somewhere between metaphor and straight-up weirdness. "Fix your stability," warns Nadia, Sarella’s fellow-burglar (and love-interest); fortunately he has a few consistency pills to get reality back to looking how it should. I say "reality," but this is actually a dream—and not just any dream. In the world of Brussolo’s novel, it turned out that mediums who were once thought to be communing with the dead were actually reaching into their own subconscious. The "ectoplasms" that they manifested were literally the stuff of dreams. And the stuff of dreams is quite remarkable. The ectoplasms radiate a benign aura, which has therapeutic effects on humans. They’re now highly sought after as sculptures, so much so that other forms of art have been rendered obsolete. The mediums of today—of whom David Sarella is one—are artists, diving into their dreams and competing to bring back the greatest ectoplasm. Society has created an entire infrastructure around the dream-sculptures, including specialist nurses from the Museum of Modern Art to monitor the mediums’ health, and disposal facilities for decaying ectoplasms, which need careful handling. Brussolo depicts a system which is essentially parasitic on its artists: it has time for you (or what it can get from you) as long as your ectoplasms are of good quality; but, when they cease to be saleable, people can always go elsewhere for their artworks (and note how, for all the research there has been into the sculptures, the ill-effects on dreamers seem not to have been investigated). But the divers keep on diving, driven by their own obsession—perhaps for the potential monetary reward (the deeper you dive, the larger an ectoplasm you might return with), perhaps just to be in the dream world. These are not exactly subtle metaphors, to be sure; but The Deep Sea Diver's Syndrome is a book that runs on broad strokes, not subtlety. The novel also addresses the nature of the dream world itself, and here readers who are so inclined can revel in disorientation and strangeness. The official position, as represented by Marianne, Sarella's nurse, is that the dream world has no objective reality—and even its subjective reality is an illusion. "Consistency pills, realism powder—they don't exist," Marianne tells David. "They're inventions of your subconscious, symbolic warning signs" (p. 27). Where Sarella experiences a jewel heist, other mediums like him might make sense of the dream through images of space exploration, or pretty much any kind of adventure scenario. What ultimately makes Brussolo's novel work for me is how it knots its different strands into strange and distinctive shapes. There are grand imaginative spectacles: David imagines his final, go-for-broke job as an attempt to steal an elaborate painting of a battle scene that comes to life during the theft—and it is a joy to read. There is plenty of detail of a society transformed by the mediums' work; but, when everything is brought together at the end, you realize just how much has been left unrevealed. Then there are the small digressions: at one point, Brussolo goes into loving detail describing David's penchant for good bread. When reading this section, the thought passed through my mind that it effectively places Sarella in the same position as a connoisseur of ectoplasms, reliant on another’s work to fulfil his own desires. But then the moment passed, and it all started to seem one of the odd blemishes that help give the book such character. This is a novel that can’t be reduced to a metaphor, or a character study, or a work of pure imagination. It is all of these things at once, incompletely and held in tension. In sum, The Deep Sea Diver's Syndrome is a 360-degree cross section through a fictional world created and dispensed with in barely two hundred pages. It is as tantalizing, frustrating, and exhilarating as that sounds.